'Seriously, your nappy headed child whose hair is full of chemicals is clouding the pool.' I wonder if this is what the owner of an apartment building in Cincinnati said to his tenant who happened to be the father of a biracial child. I mean I know some people come out the mouth with some outrageous things but really are you for real (reminds me of a line in one of Lil Wayne's song-----You should close your mouth and let your A*& talk). 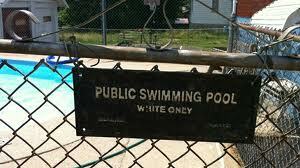 So if the little girl's hair was straight I wonder if the landlord would have objected to her swimming in the pool. Which makes me think that this isn't just a case of racism towards skin color but racism towards hair texture?!?!? There is a lot of hate in this world but you have to be pretty bad off to hate on a child or anyone because of their hair texture. One a happier and more uplifting note, for the community of natural hair lovers that have encouraged so many of us on our journey. The support that we all have is tremendous from blogs that are dedicated to natural hair, youtube channels, Facebook groups/pages, Twitterverse, meet ups, Natural hair shows, etc have played a tremendous role in uplifting naturalistas who were told that their hair wasn't beautiful or may potentially cloud the pool. In my opinion, one of the perks of being natural is the ability to get your hair wet! Feel free to share your thoughts on the article. Because they can't tell you "We don't want you with your black skin", they use " this" the hair factor thinking we are stupid enough to not understand that it is just pure and simple racism. IT IS the new way to express racism. the same think with the N word. They used the excuse that rappers used it so they can and of course it is not racism.